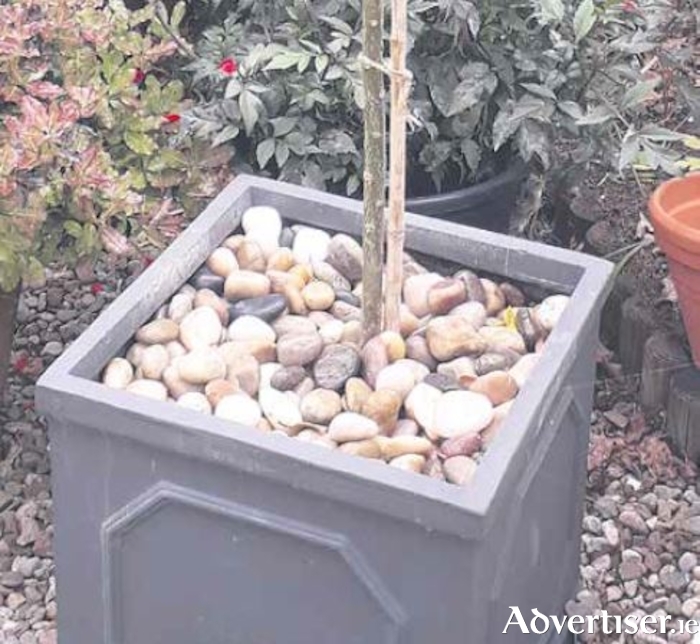 These polished cobbles from Galway Stone make a smart mulch for containers. Don’t worry about the lawn. Although they’re turning brown all over the country, when the rain returns, as it surely will, the grass will recover and return to its usual lush green. It’s best not to cut the grass in these conditions so enjoy the break! Mulch as much as you can. Homemade compost, well rotted manure or chipped bark can all be used, but you can get creative if you’re stuck – thick cardboard from boxes or layers of newspaper, weighed down, are better than nothing and you can always remove them when normal (rain ) service is resumed. Mulching helps slow down the evaporation of water from the soil but do remember to soak the ground well before you apply it. You can mulch containers too, particularly if there’s a lot of exposed compost – rounded beach cobbles and pebbles are ideal for this. Give priority to the plants that need water most – anything newly planted, as they won’t have developed strong roots to seek out water for themselves yet – and anything in containers, as they are likely to dry out quickest. When watering from a can, remove the rose and aim the spout close to the base of the plant so that the water is getting into the soil and to the roots, where it’s needed.